As many of you know, Charlie and Trigg have a Cat Power Tower cat tree, which is a product we reviewed some time ago. Unfortunately, while it is awesome, the company went out of business – so you can no longer get them. As a result, I don’t really know what to tell readers who inquire about good cat trees. DIY Tree – Find an online plan for a giant tree – even if the materials cost you $500, at least you know exactly what it’s made of and can build it to accommodate what your cats likes (tunnels, ramps, perches, hammocks). Catification – This book by Kate Benjamin and Jackson Galaxy has a pleathora of ideas and examples of what people do to provide alternative cat tree ideas inside a home. And here’s another discussion we had on Facebook about cat trees. Do you have a cat tree that your cats love? I want to know what it is to include in this list here! Please share it with me in the comments! Vesper Cat Furniture – The Vesper line has several different styles. We reviewed the V-Tower (below). You can check out all the varieties here. KletterLetter: Alphabet Letter Cat Tree Furniture – Visit KletterLetter’s website to learn more. Designer Pet Products Designer Cat Tree $289.95 on Amazon.com – This modern cat tree features 6 different levels with scratching sisal on the first level. It comes in black or white and is made of non-toxic materials. Bowsers Replus Cool Hues Cat Tree $289.99 on Amazon.com – this 5-story wooden cat tower is made in Canada. 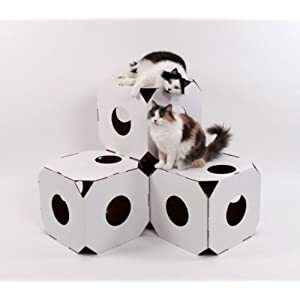 Dimensions: 21” H x 18” W x 18” D.
Catty Stacks Modular Cat Condos – they are sold in individual colors and boxes – so you can create your own. Starting at $12.99/each on Amazon.com. I use 60″ and 72″ Armarcat tree’s, 3 Ragdolls can do a number on them. they are well built and you can buy any part for them you need as they wear and get damaged. Tow of them are about 17 lbs each and hit the tree together at a run. The 2 trees have been in constant use for over 4 years and I have replaced 4 posts due to shredding of the rope. that’s it. I have a cat tree for Diva and she loved it. Unfortunately, because of a house that is for sale and realtors that say “people don’t want to see cat trees, cat or dog dishes” so her tree is broken down in boxes. But as soon as I sell this cursed house, it will be up and set up before I set up the bed. i do and i have one because cats like to be above the floor. i have theirs sitting in front of the living room window so they can look out. they love it. i bought it from a guy here that makes them and sell them in the summer at a location here in the city. they are well made and priced good.. and he will, for 35 dollars re carpet it for you. that is the only thing i don’t like about it.. carpet. he makes a mess!! i would love to have some of the posher models but i can’t afford it. my choice would be the cat power tower. i wish i could put those walkways and perches up high too. i would have them all through my place if i wasn’t renting. i have seen some places that are so cool with all the perches and trees and walkways up high for cats. they deserve to be spoiled! cats are such wonderful souls! I have a cat condo/tree similar to the above video and even though my cats are declawed (It wasn’t me – they were re-homed to me! ), they love this thing. They chase and fight on it, jump from level to level and just generally have a ball! They often fight over the top spot which is at least 6 feet off the ground. The higher the better, plus I have it by the window and they get a great view. They often sleep on it too. The closest thing we have is a cat tower scratching post with a bed/lounging area on top (made by Purrfect Post) and then the Armarkat Pet Steps Stairs Ramp for Cats and Dogs (got it from Amazon…we are on our second one at this time as she completely destroyed the first one with her scratching and carrying on…she lurves to run up and down the steps and then lay on the steps and scratch on them and balance herself…she goes crazy over this thing) that we place next to the cat tower on the left side so she can easily climb in and out of the lounging area on top of the cat tower. Since she is so big we hate to think of her jumping all the way out of the cat tower to the ground (would eventually hurt her joints as she gets older). So on the left side of our Purrfect Post Cat Tower Scratcher/Lounger thingy we have the Armarkat Pet Steps Stairs Ramp for Cats and Dogs and on the right side of the tower is the arm of our loveseat. So she can climb and jump into the lounging area on the top of her cat lounger from either side. Our living room looks like a daycare center or kitties with all the schtuff we have set up for her. Quite honestly, there is not even room in our small apartment in any of the rooms for a cat tree to be installed at this time. Plus, our girl is not much of a climber. So it all works out very well! Yes, we have a few because like the Floppycaters who posted above, my girls love being elevated so they can see the birdies, smell the fresh air out the window and, simply get away and have some alone time. The ones we have are from Royal Cat Boutique which is a family-owned and operated business. They take great pride in their quality craftsmanship. The cat trees and lounges blend into whatever furniture scheme you have and come in a variety of different colors and fabrics. The frames are very sturdy. The material coverings are human grade quality fabric and vinyl that are very durable. They are very easy to keep clean and spot clean when necessary. Just a quick brush with a Lily Brush or a damp paper towel and the fur just rolls up into a ball. We have had these for about 3 years now and they still all look brand new but have been used and loved every single day by 3 kitties. Royal Cat Boutique also sells excellent sisal cat scratchers. We’ve had those for the same amount of time as the cat trees and lounges and they are used daily but still hardly show any wear at all. The photos of their pieces give you good a size representation and idea how they look, but you really have to see them in person to appreciate their quality.